Among the colder states in the nation, Montana is in U.S. Department of Agriculture Plant Hardiness Zones 3b and 4a. Temperatures may drop to -30 degrees F in the winter. Montana experiences hard freezes, gets plenty of snow and has sub-zero temperatures through much of the winter. The growing season is short, about 75 days. Montana summers are temperate and dry. Some cold-weather nut trees thrive in the this climate, and bear fruit in fall or winter. Black Walnut (Juglans nigra) is native from the Eastern Seaboard to Minnesota but grows well in Montana's dry, mild summers. These deciduous trees, which may inhibit growth of other plants, can grow to 150 feet and produce richly flavored nuts in a hard shell. The trees have black-brown bark and high branches that form an oval or round head. Leaves are made up of groups of up to 23 leaflets, each of which may be up to 5 inches long. Black Walnut trees, also grown for their bark, are a hardwood that may be used in flooring or to make furniture. These trees require full sun and regular water. 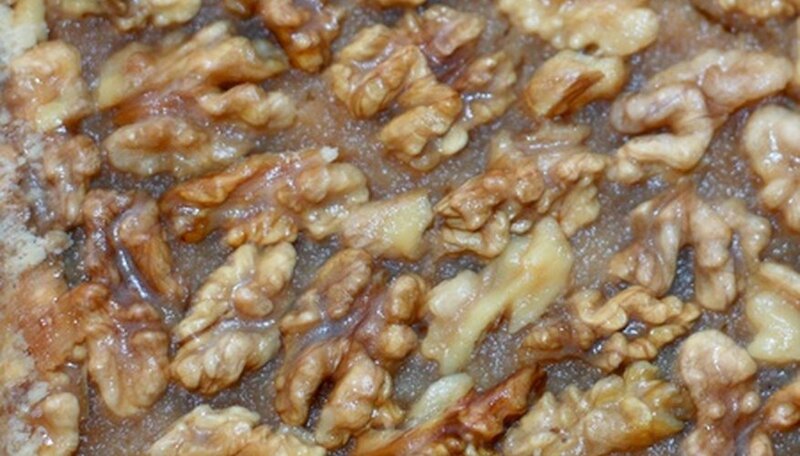 The Butternut Walnut (J. cinera) and some varieties of the English Walnut (J. regia) also are suitable for Montana. Chinese Chestnut trees (Castanea mollissima) are hardy to Zone 4 and may be planted in southern Montana. Chinese chestnuts, which produce a fragrant, edible nut in a relatively prickly shell, can grow to 45 feet and have dark green leaves of up to 8 inches that may turn gold or yellow before dropping in fall. Nuts are produced in winter. The Chinese chestnut is resistant to chestnut blight. It should be planted in full sun and get regular water but can tolerate drought. This tree is highly adaptable and may be planted in dry or acidic soils. Hazelnuts, also known as Filberts, are a member of the Betulaceae family and are native to North America. Commercially grown in Oregon, Washington and southern Canada, this tree is hardy enough to grow in Montana, though it may not produce nuts. A hazelnut tree can grow to 15 feet and produces sucker branches that must be cleared to avoid forming a thicket. Cross-pollination is required, so two trees should be planted if nuts are desired. Hazelnut trees should be planted in full sun and require regular water. The hazelnut itself is small and tasty and grows in a hard, rich brown, acorn-shaped shell. The nut is often used in confections and spreads or may be mixed with chocolate in truffles. It is also a popular flavoring for coffee.